Welp, it’s time once again to log out of WordPress and turn out the lights. Once again, blogging is dead. Seems at least once a year, a flurry of discussion erupts around the imminent demise of blogging. And then the rest of us shrug our shoulders, grab some coffee, and get back to creating content that further solidifies our web presence. Don’t get me wrong… as always, change is definitely happening. But it doesn’t mean blogging is dead this time around anymore than it has every other time this discussion pops up. Like the last time I addressed this topic, the basic argument is that the rapid growth of Facebook and Twitter has dampened the urge to blog. Since social networking is much easier than creating long-form content, why bother blogging? Chris Brogan delivered the immediate logical response—that while snack-sized social networking content has its place, from a marketing standpoint it only works in conjunction with longer, more thoughtful content. And while blogging veteran Steve Rubel worries about long-form content in a short-attention-span world, he’ll continue to blog—because he knows he has valuable ideas to share that don’t fit in 140 characters. The impact of Facebook and Twitter is a powerful trend that shouldn’t be dismissed (in fact, content creators should be using at least one of them). But the story remains the same: people who mainly want to socialize, share links, and post pictures of their cat should be using social networks instead of blogging, and that’s exactly what’s happening. Those of us with different aspirations continue to blog, and smartly use social networking sites to promote our content while adding value in those venues. Whether you’re trying to build an online business, market your stuff, or promote a cause, those who seek maximum influence know that creating valuable longer content is the way to go. People are still reading blogs, and other content. But for the creation of amateur content, their heyday for the wider population has, I think, already passed. The short head of blogging thrives. Its long tail, though, has lapsed into desuetude. So, are you in the short head (or “short tail”) of blogging? What’s the Short Tail of Blogging? When people think of the “short tail” of blogs, they generally think of the large blogs that reside in the Technorati Top 100. The blogs that are really new media versions of traditional publications, but have a lot of unique social media characteristics that set them apart from mainstream media (at least for now). I think that definition of the short tail is short sighted. Big blogs that rely on a CPM advertising model are naturally prominent, because they have to attract massive amounts of traffic to make any real money. But there are plenty of business-oriented blogs that drive significant revenue without massive traffic, because they use content to attract prospects and convert them into new customers. Software, training, freelance services, real estate, wine, art and more are sold thanks to the power of attraction, trust, and conversion that blogs possess (when done well). It’s also essential to remember that unlike the transient nature of Twitter and the great walled garden of Facebook, blog posts are effectively conversations that are eternally visible through Google, meaning they have more inherent value to brands. In the broadest sense, a “brand” is anyone with a message with a point beyond what you’re having for lunch. If that sounds like you, better stick with the blogging. Even if you never call it that. Here at Copyblogger, we’ve been teaching the intersection of content and copywriting for three-and-a-half years. We started well before the term content marketing came into vogue, and yet content has been the driving force behind online marketing since the inception of the web. Content marketing is really what this is all about. Blogging (in the sense of the software and the best practices that help content spread and community grow) is simply the centerpiece of the effective and efficient practice of online content marketing. So forget blogging as a movement, if you’d like. But keep the content marketing rolling. Content Marketer. I love it. That’s what I’m going to start calling myself. Nearly two years later in the future, Michael, am I writing to you in the past? I’m here, for sure. But you’re here, too. I’m open to the possibility of blogging one day dying. But I think there will always be enough people on the globe who want to express themselves in a more substantial way than twitter or facebook. And these very people who pursue blogs are naturally going to read them too. That, right there, is a huge chunk of people that is unlikely to die off anytime soon. Beyond that, reading blogs is a source of entertainment just as any other medium is. As long as a blog entertains and informs well… there will be an audience. There are a lot of people resistant to longer-form blogging. It’s just how they’re wired. Twitter and Facebook gave them a medium that they are more comfortable with. I very much agree with Michael. The term blogging may fade quite a bit, that’s a question of fashion, really. The actual activity is just getting started. I think the days of it everybody having a blog are probably numbered, and Facebook and Twitter will take up the slack for people who simply want to share their lives with friends and family. For those of us who blog with a real purpose and for a living, blogging will remain a constant and hopefully our readers will continue to enjoy what we have to say. The real growth area will come from corporate blogs, as you say Brian, designed to drive incremental business. FB and Twitter actually excel your content marketing efforts. In fact, you’ll get maximum exposure from social media, if you’ve a blog with solid content. @Shannon – All the best! It does make you wonder if in the near future we will look back and wonder what happened. I think there will always be a need for social interaction and the medium might change but something will just take its place. Content Marketing is clearly my thing. If you want to convey any substantial idea, even a repeated series of 140 characters just won’t be enough. I understand today’s short-attention-span youngsters love Twitter and the likes of it, because a) they don’t (yet) have that much to say, and b) they are so impatient they just can’t focus on anything longer than “What are you doing?” When they grow up, they, too, will want to say more. 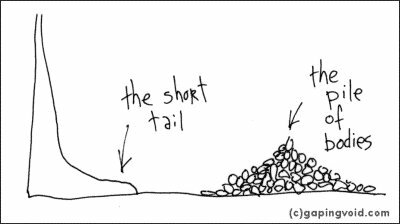 I think both the long tail and the short tail have their virtues. Short tail acts perfectly as a “keyword list” driving traffic someplace else, while long tail gives you the meat on the bones. The quality of blogging has substantially increased, in my estimation. But I also submit that it’s because Twitter has, somewhat, forced hobby-bloggers and dabblers to migrate to Twitter. Casual bloggers much prefer Twitter, because it’s less work and an outlet for posting their senseless or meandering thoughts, which is what they used to use their blogs for in the first place. Those who have converted from blogging to Twittering are less inclined to blog regularly, with a purpose in mind, or for business. I also submit that, if they wasted time blogging, Twitter will be no different and probably even more distracting, anyway. So it will certainly attract those who blogged for no other purpose than to waste time — it may have attracted those who used blogging simply as a means of publicizing their blather. Invariably, this has opened up the floor to better bloggers and better blogs. Maybe it’s because they test more on Twitter before they put their content to a blog post. Maybe it’s because they get real-time feedback on the quality of their content before they publish it. Or maybe it’s because Twitter has given bloggers the opportunity to post their less important stuff there, leaving their blogs for better, more purposeful communications. But I do know that I’ve seen a jump in quality of late. Whatever is left has become stronger, tighter, better written, more compelling, and certainly more interesting. In my estimation, anyway. Are you really sure that blogging is dead yet again? I thought it was dead long, long ago. Putting up a site and letting others create or write the content for you and just sitting back and moderating is the wave of the future. Yeah, blogging is dead. So why do I still keep blogging? I don’ t know. And as long as you A listers refuse to read or link to D listers, you can keep us at bay. Keep your foot our our necks. Someday we will rise up! I’m as mad as hell… ah screw it. Someone just told me CopyBlogger was dead, so I came by to check. It doesn’t look dead. I was afraid it had died like copy writing did years ago, like how PR died, shortly after print advertising died (right around when the Internet took off). I wish I had invested in plastics back in the 60’s, but I’m glad I didn’t short paper stocks when the Internet took off and everyone said offices were going paperless, or short cable/wire stocks when the cellphone systems was invented back, what, 20 years ago? Thanks for the pep talk. I write a humor blog. It’s a strictly non-profit enterprise. But I would like to have eyes on my posts, so I can get discouraged. I enjoy blogging and I don’t think it’s going anywhere. I’ll keep plugging even if nobody’s reading. Darn. I wish you had told me that before I wasted my time writing my last post. Twitter, Facebook and social media are good for blogging. A lot of people got into blogging as a way to express themselves, share their thoughts, etc, but they weren’t willing to put in the time to become a good blogger. Social media is a much better tool for these kinds of people. If less people blog, it will make the remaining blogs stronger. We still have an over saturation of bloggers, and if social media can help reduce that saturation, it’s good for everyone. But for bloggers, social media is a boon too. Sites like Twitter go hand-in-hand with good blogging and are much more of a compliment than a competitor to blogging. A blogger can post short tidbits to Twitter, instead of trying to stretch everything into a post. Twitter also makes a good place to toss around ideas and start convos that can lead to blog posts. The idea that blogging is dead or dying is crazy. Certainly the era of the personal, amateur blogger is dying, but blogging remains a professional force. NYT: blog to reflect; tweet to react. This makes it easy to discern the difference and to convey it to others. Don’t have time to read all the comments so if this has been said then I apologize. What does twitter link to? Blogs. Mostly. End of discussion. As a C or maybe (D list?) blogger, it can feel like a waste of time at times, but as long as I’m still enjoying myself, Ill just carry on. I like your definition of “brand.” That’s inspiring. It’s a bit ironic that these doomsayers made this prediction on….uhh…uhh….uhh…BLOG POSTS! Anyone can use Facebook or Twitter. Quality blogging is a challenge that many people can’t accept. Thoughtful and succinct, Brian — just what is needed right now. Blogs are simply evolving at a natural pace to replace traditional publications. That’s why it’s good for serious bloggers like us here at Copyblogger to stay focused on quality content above anything else. We’ll be the ones in control of the media before too long. Charles, amen to that. At a minimum, we’ll be a normal part of the media… no more distinctions between mainstream and social. The only time blogging will die is when search dies. And that’s not going to ever happen. As long as google can find blog content that’s relevant to search queries, blogs will continue to be valuable. It’s not like one day, search algorithms are going to filter out relevant blog content. It’s ridiculous. Plus, blogging will just continue to morph and evolve. By the way, the NY Times site is run on worpress, so blogging CMS are only becoming more legitimized. The eminent demise of blogging? or the imminent demise of blogging? Isn’t it amazing that now, we regard the blog as “long form” content? Incredible! Perhaps we’re devolving and one day soon, Tweets will be “long form” content and the preferred method of communications will be in grunts and gasps — delivered digitally, of course. All those tinyurls and bit.lys have to point to SOMETHING obviously, and blogs are the only source that can meet the massive demand. Tis a good time for short-tail bloggers. – Death of print media –> a gain for short-tail blogs that deliver up-to-the-minute, quality content. – Rise of Twitter, Facebook –> fewer amateur bloggers, more blog consumers (ie, bit.lys linking to short-tail blogs). – be engaged with Twitter and Facebook, without compromising the quality or frequency of blog posts. Facebook and Twitter to me are like myspace. Yes, it’s coold to say whats up and you look sute in that picture, but it gets old. Blogging in a monetizable niche or mutiple niches is the way to freedom and blogging heavan. @Michael Fortin, thanks for that comment, lots of great points. I still see blogging as the hub of content. Twitter and Facebook still need to point somewhere, and frankly, the worth of a “.com” can’t be overstated. People want that stylistic and content control. In my eyes, FB and Twitter are like outreach programs for what’s going on at your home base, your .com, your blog. The Internet is about freedom and I’m not sure whether Facebook quite ‘gets that.’ It wants to control and make its site the hub of everything Internet related. I just don’t see that happening. Microsoft tried that and failed. I see that happening with Facebook too. It’s already getting some excess bloat around its mid-section. More and more of my friends are pulling content, just as they did with MySpace. Should be interesting to see its development (or regression) a year from now. Blogging, however, will probably be just as popular 10 years from now. I have not seen a decline in readers of my blos, but I have seen a decline in the number of comments. I feel pretty sure this is due to FB and Twitter, and especially the way FB creates its own url when you post your links on it. Anybody else have thoughts on this and what to do about it? Michael, it makes me *really excited* to read, from your experience, how blogging is only beginning to take shape. Thanks for that encouragement! Michel, I also see how FB and Twitter constructively detract from all the blogging noise that once was about what people ate for lunch. Thinning out the blogosphere to lean content-marketing mass — eventually calling forth the next fashionably fitting term. Gloria, my modest traffic jumped one day when someone linked an article into their LiveJournal. I noticed that a few discussions on LiveJournal as well as other blogs sprung up in response to the article. Of course I’d have loved it if those comments were cemented directly under *my* article, but I wasn’t complaining. I got to peek at the discussion on the web turf where those commentators felt most comfortable sharing their reactions to the article — helped me out tremendously in terms of getting a feel for reader response. I think if you just do your best to plug into those comment threads as they pop up on FB or Twitter or whatever, that’s all you really need. I have no problem with people who think blogging is dead. Makes it easier for us new bloggers to rise. hehe. I’ve just started my new blog, as an experience to go alongside my new book. So the blog itself is an added value (before AND after reading the book). Who cares what happens in the blogging world? My site will retain value regardless. And the same holds true for any bloggers contributing genuine value. Well-written and well-presented ideas (which is all good blogging is) are VALUE. And value doesn’t die. My 2 cents as a new blogger (who’s doing long-form blogging, at that!). it’s only a nuisance with deadly consequences sometimes. Blanket statements like “blogging is dead” are just plain dumb. Or in this case, sarcasm. Thanks for the commentary, Brian. To think that most of my peers don’t even know what blogging or content marketing can do for their business. I don’t think blogging is dead. Twitter and Facebook are popular and they serve their own purpose of connecting people. But blogs they provide more in-depth information and attract readers. One thing I worry about is that if FTC starts cracking down hard on blogs then it might considerably reduce the number of blogs. In that case only a handful of blogs will survive. Survival of the fittest. Reading the comments I think some people are unclear on what ‘Content Marketing’ means. Content Marketing, in the context that Brian is using it in, means using content(blog posts in this case) as a means to market your product or service and make more sales, not to ‘market your content’. Giving away high quality, valuable content, is the best way to build trust with your audience, and in turn sell them more stuff that solves their problems. “Software, training, freelance services, real estate, wine, art and more are sold thanks to the power of attraction, trust, and conversion that blogs possess (when done well).” Well put. Good post. I agree blogging is not dead. But blogging as long as just wasting time and not effective as marketing tool. The way you mention your blog idea (Blogging Dead) is really inspiring thoughts. Your blog will helpful for me as well for most of the bloggers. can never be replaced by twitter and/or facebook. strategies with only 140 characters? You can’t be quoting people all your life, or can you? I believe that blogging is still in its infancy and still has a long way to go before achieving a critical mass of acceptance. I talk to people all the time who have never read a blog and wouldn’t know a blog from a web site. They’re still getting their news and information from newspapers, TV and radio (and social networking sites). As more and more businesses turn to blogging to promote themselves, and as more and more journalists turn to blogging to break stories or to express their views, you’re going to see a continuous increase in the popularity and influence of blogging. Gutsy move on Steve’s part! I think both have their place – blogging and life streaming. The difference is that it will get tougher to make a blog successful. The louder the noise, the more selective we get. In my opinion, a blog will thrive so long as it has great content, (like copyblogger), and it will fall on its face if the content’s generic. People will always want access to useful / interesting information. Whether that’s provided via a blog, a FriendFeed stream or whatever – the content is where the value is. Thanks for another well-written post Brian! A great blog is all about great content and that’s what everyone is after. The readers and the search engines too. And from a marketing perspective, I feel social media has it’s place, but it’s only the beginning of the sales process. All I can tell you is that I read every word of this article. Right to the end. But if I wasn’t a regular subscriber, I might have been interested in clicking over to it as a result of a tweet. So to me, Twitter is like a little alarm system to alert me to what I might have missed out there. But it is the appetizer, not the main course. My blog is definitely not in the obituary section. Get new readers every day. It is important not to bury anyone until after they have died. content marketing is a nice word to describe blogging. But I believe video posts are the future. I’ve been doing video posts for a few months now and wonder, why there are not more of them around. I don’t care how awesome facebook and twitter get — as long as Brian and friends stay here, I’ll be here too. And that’s why blogging’s life isn’t in danger. WordPress, Blogger, Twitter, Facebook — these are all just platforms for serving content. Just like not every dish needs to be a bowl, not every online content platform needs to be a [fill-in-the-blank]. It’s the content that breathes life in a content platform. Keep your content on the uppity-up, and you won’t have to fret over the “death” of your platform. Once again, great content from Brian and interesing points and counterpoints. As a somewhat new kid on the block, I’ve quickly realized bloggers tend to congregate in two camps: this one, where a serious content-orientation forms the basis for networking, marketing and community, and what I’ll call “blah blah bloggers” (no disrespect intended, the web is for everybody) who want to tell us what they did last night. One is all about value. The other is an evolution of text messaging and recreational dumping. It’s the difference between country clubs and the PGA/LPGA tour, between gym rats and the NBA, between kareoke and American Idol. My guess is few of the blah blah bloggers hang here, and if there’s any truth to the death nell Brian writes about, it’s hovering over their camp, not this one. I still have absolutely no clue what the difference between blogging and lifecasting actually is, nor do I care that Steve Rubel seems to make such a big deal out of it. We spend far too much time talking about the medium and how we’re going to deliver information than the message itself and that’s sad. Who gives a crap whether I get info via lifecast, blog, twitter or email? They all end up on the same place, right? Phillip- video posts are usually pretty annoying. I can’t read video posts quickly, I can’t skim through multiple articles while at lunch and I can’t easily print them out and take them somewhere. Video blogging is inherently selfish. You expect your audience to listen to your thoughts on YOUR terms, instead of theirs. They can’t control anything but start/stop. If that’s “selfish”, then all blogging is selfish, because we’re the ones who pick what choices are allowed on the blog. It’s just a question of taste, really. This is quite a harsh title to new article, while I agree it’ll be harder, but it’s even better – users will get better information and don’t spend time with useless sites with no impact at all. @Tyler that’s exactly the point with video post. 1) it’s your thoughts and that’s what blogs are about. 2) you get much more info in a 3 minute video post. Reading 3 minutes might give you an idea but never the whole point of a post. You need of course to write a few things around the video, so the visitor can decide if he want’s to view the video. Plus videos are viewed on youtube etc which spreads your message, brand, name etc in the web. But I also get your point. I’ll continiue for a few more months and then see if it’s worth it. This is a good thing, much like “this economy” is flushing out all the dabblers in business. All the company’s that jumped into business when every thing was good are now struggling. They are struggling because they don’t know how to function when times are hard. Much like blogging, the bloggers that are not serious about there craft are being flushed. This is raising the bar for every one else, that is a good thing. It is true that the more diverse ways we communicate the others are obviously going to become diluted. Max, nice comment… but since when were blogs NOT social media? You mean social “networking” didn’t kill blogs, right? Blogging does not work as the same it did 5 years ago. Like you said, change is always happening. Today, you cannot run a blog like you used to do before. Top bloggers have turned their blogs into micro-social networks where people can really contribute to the topics, discussions and content. A powerful blog is an authority website. As you mentioned, content plays a very large role in creating a successful blog. It can still used as a branding platform for many business owners, as an online news publication resource or like a comprehensive guide on a hot subject. Regardless of its type, blogging still works. There should be a unique idea and a solid business model behind a blog in order to make it successful. Publishing posts just because of updating our blogs and getting some readers does not work any more. We should have a plan for the blog topic, the content, traffic, monetization and so on. In my opinion, blogging is still a killer way for running a profitable online business when done properly. I like the Content Marketer (or Provider) title and offering. FB and Twitter are good, they’re fun but are also important in the branding mix. However, if you’re at the store or getting a coffee, don’t blog about it unless it’s pertinent. I think the best way to differentiate the two are whether amateur hour is over or not. I’m writing a blog about writing, traveling and inspiration. It’s been going for three months but I’m not calling it a blog anymore but a website. Blogs seem to have such a bad press and what is a blog anyway but a dynamic website with content that’s updated often and feedback from readers. My reader stats are creeping up and I hope to meet my goals for the end of the year. It’s a funny old game but someone’s got to do it! Good luck everyone. But it doesn’t make me any less hungry for Dinner (Blogs). Twitter is also a tasty place full of delicious poetry to inspire you Joe, and tickle your taste buds before Dinner. The blogs that continue to create and produce relevant information and articles will, of course, survive. Those that run blogs that just “re-blog” others info are headed for a demise. And I would make a very unscientific guess that 80% of blogs are just reblogging others. The same goes for Twitter. How many accounts will keep attention if they are just ReTweet machines? Put out some original content if you really want to compete. Eh…I wouldn’t worry about it. Some of us blog because we’re writers. [ahem] I don’t give a fart if blogging is “dead” or just in the hospital. I’m online writing because I’m a writer, period, and this is the most immediate, satisfying way to share my words and thoughts. I see blogging and social media use as completely separate, but that should be used to intersect and support eachother, not replace eachother. Although I consider myself a whiz at multi-tasking, I can’t handle too many social media outlets simultaneously. I find myself managing accounts and not getting any work done! I’ve decided to use my blog to express my thoughts and philosophies about marketing, business and social media and to supplement, I mainly use Twitter as a marketing vehicle and a way to connect with people – easy to manage for that purpose, it’s quick little thought bites or links to larger ideas that can’t possibly be expressed in 140 characters. Twitter cannot replace blogging, it’s just a vehicle to enhance it and promote it. (1) My gut reaction is that Michel Fortin is right. Competition and distraction weeds out casual and fad blogging. I think a similar pattern is beginning to emerge on Twitter. At this point in the wave, the vast majority don’t tweet and don’t stay. Eventually, the numbers will attenuate to reality. (2) In partial response to someone’s question above, I just read Yaro Starak recommend heavy engagement of blog writers in blog comments. Keeping the conversations going tends to keep the comments (and traffic) coming. (3) Anyone have any comments about the use of blogging in academia? Academics trade in information. (4) Is the business use of blogging usually akin to offline chamber of commerce meetings — B2B marketing more than to run of the mill consumers (or is it niche dependent)? Direct mail isn’t even dead. There are people today, who are gonna make a million THIS YEAR from direct mail advertising. Maybe it’s a real estate agent, maybe a mortgage broker, maybe someone selling something to a great list. The point is: virtuosity in ANY form is still around, alive & kicking. I like what you have to say on this topic. I think that blogging is now an integral part of most websites. So if anything, casual bloggers have caused mainstream sites to be a little more interactive. Most blogs that sit on top of the various blog lists are only there because of the CPM advertising. As a casual blogger myself my interest spikes and falls depending on the time I have and what I experience. I am quite happy to leave the hard work to the real word smiths. Keep it up. To say blogging is dead would be to say the internet is dead. As the post points out, Twitter is helping blogs, not wiping them out. Blogs are a huge part of the internet’s information draw, and many people depend on that information. Thank you for this post. Just when I got started blogging I saw several articles about blogging being dead and I got somewhat discouraged. Thanks for clearing up some of the misconceptions about this and keeping many of us encouraged to keep going. Great post! Its all about the content! I think the decline in blogging is good for the people who put in long hours into their content. Since there are less casual bloggers, it makes the art much more special. And yes, I called it art. i think it is a passing trend. people get a little upset sometimes when expectations meet reality; not to mention the blogging spectrum is a little crowded. like Carlos Miceli stated value will increase. “he’ll continue to blog—because he knows he has valuable ideas to share that don’t fit in 140 characters.”, exactly. Twitter and facebook are best used for sharing the imminent or currently occuring; blogging for the measured understanding of what has already occurred – IMHO. I’m too busy enjoying the moment to tell anyone else so I blog and share what I discovered. There are all sorts of functional reasons that have already been identified as to why Facebook sans blog is a very bad idea. My top reason is that Facebook employs noindex and nofollow tags, meaning that there’s no real way to put keyword-rich copy on my Facebook account and have it indexed. Aside from that, I think the question of whether blogging is dead (no, it’s not) is a product of two logical fallacies. One is the idea that there’s a silver bullet solution for all your communication needs. If you want to communicate with a discrete group group of individuals, hit Facebook. If you want to attract a new group, blog. It’s not one versus the other. The other ill-conceived notion flows from the first: that you’re just trying to communicate, without taking into consideration what you’re trying to say and how that message might best be delivered. For quick updates, hit Twitter. For long-form, ongoing conversations, it’s hard to beat a blog. Thanks Maestro, that makes good sense. It’s also good news to me, as I’m upgrading my website to Web 2.0, and look forward to blogging my views and news far and wide. BTW, to set the cat among the pigeons, I just heard “The Video Marketing Queen” Maria Andros claim that YouTube, Twitter and Facebook, in that order, are currently the best online marketing tools. “Blog” is not a verb. One reads/writes (web)logs, the same way one reads/writes newspapers, books and magazines. For some media analyst or personality to say “Blogging is Dead”, what they’re actually (trying to) say is “Writing is Dead” which, of course, is utterly absurd. People will not stop writing and publishing, whatever the medium. This has been quite a blog affirming list of comments and, the more I think about it, the more I can see the likes of twitter coming and going. Who can be bothered with all these social media sites? Content marketing using a blog is here to stay and grow and at least you own it (probably unlike twitter/facebook). And while it has been around for a while, blogging is just a form of expression among other things. Twitter & FaceBook do not replace blogging, except for those whose posts was very similar to their status updates on the social networking sites. To say something of value, a blog seems to me still an ideal channel of communication, if used and marketed professionally. As always, thank you for a great post! Blogging will never die…it will only evolve…period. Seems like it’s all still alive and kicking around here anyway! “One is the idea that there’s a silver bullet solution for all your communication needs. If you want to communicate with a discrete group group of individuals, hit Facebook. If you want to attract a new group, blog. It’s not one versus the other” yeas. i like it nice post. thank you. Blogging is a fantastic medium for combining those two activities on the internet, so it will never die. Blogging can’t be dead. And I don’t think it will. Sure, newspapers are no longer printed in paper but there will always be a way for it to reinvent itself. Soon, if blogging will indeed die, it’s probably just in another form called…tweet? Just a thought. I wasn’t going to say anything, but then my pet rat crawled across my keyboard and wrote “vnlnl” and stepped on enter and I thought that she actually posted a comment and I though it was kind of funny, so I Tweeted about it but then I realized that the comment didn’t post because I didn’t fill in the required fields because I had no way of anticipating that my pet rat would try to leave an awesome comment on your blog and then I felt like I had lied to my followers about the whole thing, so now I’m posting this to defend my/my rat’s honor. Sorry I strayed from the topic… here’s a related comment: Blogging is not dead. It’s just undergoing natural selection. I agree with u Brian, Facebook has overshadowed the blooging. A blog is just a website. Sure, the CMS is built so that you can easily add articles. Saying that blogging is dead is a little ridiculous to me. That’s like saying websites are now dead. If a person updates a blog once a month and a webmaster creates 12 new pages a year for a standard site, what’s the real difference? @John, We think it’s a litte ridiculous as well. And that’s an excellent point. Sometimes I wonder if it’s the term blogging that’s on the terminal list. For me, one key reason why I think blogging “must” survive is the concept of citizen journalism and its value to a free society. Thanks for a great article. The difference is that it will get tougher to make a blog successful.